The ultimate sandy beach awaits you at the Saratoga Beach Resort! 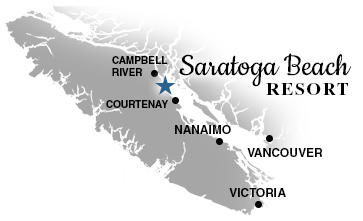 We are located half way between Courtenay and Campbell River in Black Creek on Vancouver Island. Saratoga Beach has been a favoured choice of beach vacationers for decades because of our wide stretch of glistening sandy shoreline. Our resort sits on 200 feet of sandy beach on Vancouver Island. Saratoga Beach is perfect for skimboarding, sandcastle building and kite-flying as well as laying in the sun with a good book. Then relax in the evening around our communal fire pit to chat with fellow guests. With the gentle slope of our beach, the tides create a huge playground paradise for kids and adults alike. The calm waters and shelter of the east coast of Vancouver Island provide a haven for safe swimming free of strong currents and powerboats. Our resort spans over 200 feet of Saratoga Beach and provides the perfect location for your beach vacation. Our cottages include all the amenities, full kitchens, electric heat and three piece bathrooms. Cable tv is included and wifi is available throughout the resort for all our guests. Please check out our Cottages page for more information. Offering everything you need to ensure your comfort. Our beachfront RV park has new washroom and shower facilities as well as laundry. Wifi is available throughout the resort. 30 amp power, water, cable tv and sewer are also available at each site. For a layout of our park, please see the RV’s Camping page. Our beach resort is open all year! While our busiest season is the summer there are many activities year round that bring guests to the Saratoga Beach Resort. Mount Washington is close by and we offer great winter storm viewing. Click here to check out all the activities our area has to offer. Special winter rates and monthly rentals are available, please click here to check out our seasonal rates. Take a look through our photo gallery to see all that we have to offer for your beach vacation on Vancouver Island. Cottages have complete kitchens, electric heating, three piece bathrooms and propane barbecues. Our RV resort has grassy, level sites with all the amenities including washrooms, showers and laundry.